Sorry for the late post. I’m still recovering from my weekend trip with my fellow postulants to Philadelphia to see Pope Francis. Pieces had fallen smoothly into place. A few months ago, we had managed to snag tickets to the Independence Hall speech and papal Mass. A place to stay and transportation had worked out smoothly. But taking a picture of the pontiff didn’t go smoothly for me. Colin, Leland, Joel, Brenden, Jeremy and I met with Jeremy’s friends, who had staked out a spot outside the National Constitution Center on Saturday for the speech. The crowd roared as the pope arrived in the Popemobile. He was several yards away, but I decided to take a chance with my digital camera. Pope Francis arrives for his speech at Independence Hall in Philadelphia on Saturday, Sept. 26, 2015. I’m still surprised how clear the picture came out. I had forgotten how good the focus on my digital camera was. 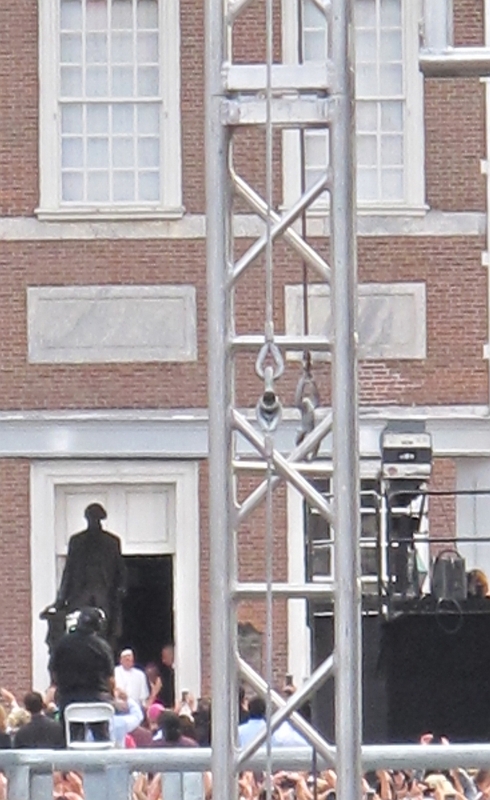 When the pope came out of Independence Hall, he seemed like a tiny white dot in the doorway. I tried again with my camera. Pope Francis comes out of Independence Hall in Philadelphia to give his speech on Saturday, Sept. 26, 2015. OK, so I got only a white dot. Pope Francis gave the speech in Spanish. My Spanish comprehension was still basic. With everyone standing, I couldn’t see the English translation. A few days later, I read the transcript, which is an amazing speech on religious freedom. Before the papal Mass on Sunday, I had hoped to take a better picture of the pontiff. There, he was coming up the street in front of us. I moved forward and held up my camera high. But I got nothing in the confusion with the crowd. Like Moses, who had seen the back of God, I saw the back of the Holy Father. 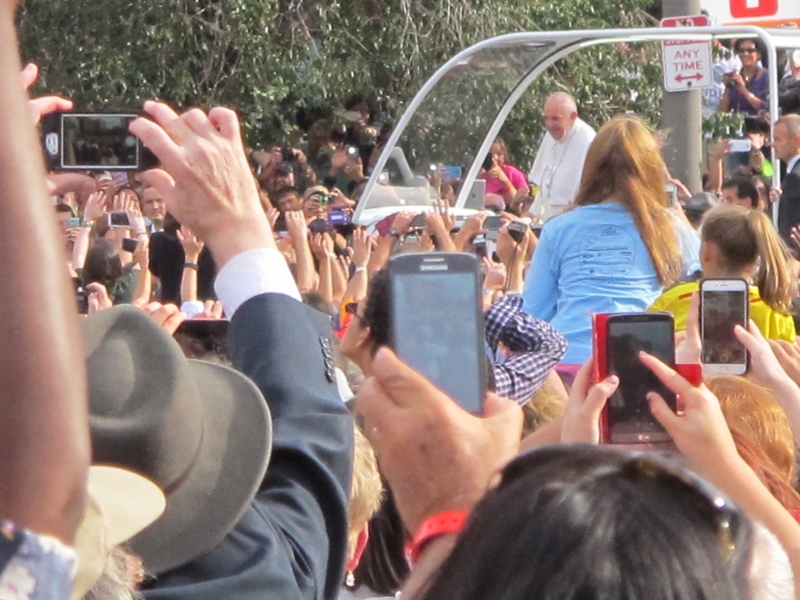 Meanwhile, Joel climbed up a tree and captured this video of the pope’s arrival. 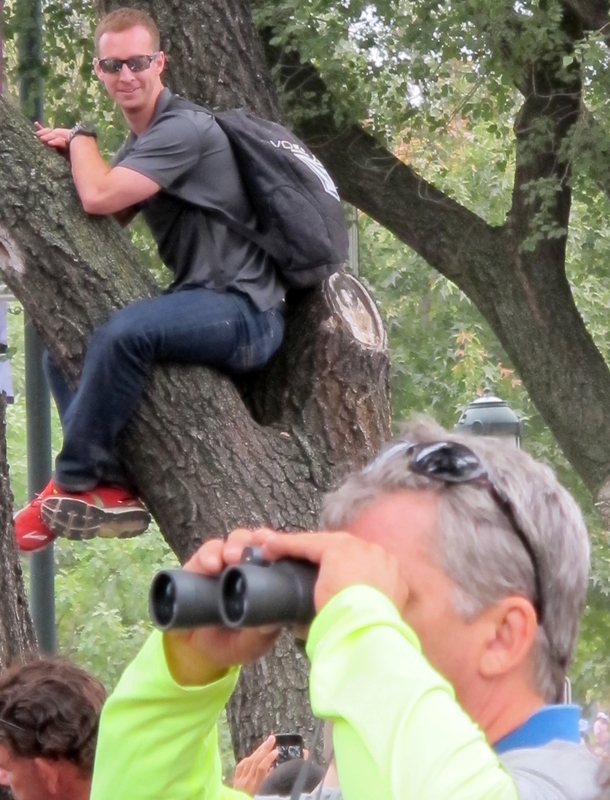 Joel Ament had climbed up this tree for Pope Francis’ arrival at the Ben Franklin Parkway in Philadelphia on Sept. 27, 2015. Jeremy suggested standing atop the lawn chair for a better angle. He was right. I managed to take a few pictures during Mass including this one during his homily. Pope Francis gives his homily at the Ben Franklin Parkway in Philadelphia on Sunday, Sept. 20, 2015. Again, Pope Francis spoke in Spanish. Once more, with everyone standing, I could barely see the translation. But through my camera, I saw the words “don’t hold back” on the screen. Maybe those were the words I needed that day. I had just about given up trying to figure out what he was saying when I overheard an English translation from the electronics of nearby attendees. Thus, I caught the last words of the homily, which I later read back in Boston. I need some sleep. I’ll post follow-up entries on the trip concerning friendly faces (Oct. 5) and audio books (Oct. 12).